We ACHIEVERSRULE Team Just Updated our Official EXAM360 Android App which is now available at your most trusted Platform i.e. Google Playstore. 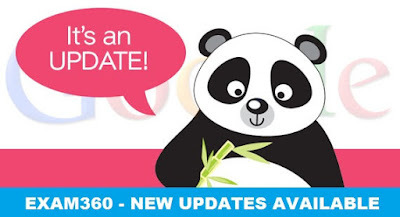 Frequentlly we are trying to collect Students Feedback through various ways, Now the EXAM360 Android App is available at Google Playstore with some extra features which will help our users to access the app with more efficiently. Refresh New Feeds: In the Latest Version of EXAM360 Android App You all can refresh your app by just a Scroll down & also we added manual button in the Top Right Corner of the App. So You can access the new feeds easily without any effort. Auto Cache Clearning: This is one of the most important features for every android users. It will Automatically Clear Your Old Storage Data of EXAM360 App. This will not reduce your stored memory but also help you to speed up your phone automatically & keep your memory clean. App Size: Its important to maintain everything including the Size of the App. Yes , It just 2.4 MB. Be sure we won't give stress to our job aspirants. In this regards we are really speachless. Here also we are the first Educational Platform the app Size is below 2.5MB. Apart from all the above mentioned points their are many other features & Layout were added which will help you to share A-Z with your friends. In Comming Days we will also upgrade the app with Some Test MCQ Based Questions & Answers. But for now we think its enough. If you have any doubt or suggestion, Feedback your comment section is 24*7 open for all our users. We Request all our users to upgrade the App with some extra features which we have added. We also assured you we will deliver the best quality. Due to Huge Overload we can't manage everything at once. Give Us Time. Be sure we will fulfill all your requirements. For Further Query / Suggestions Please Give us in Comment.